The fifth airport of the day was thankfully the last. I opted to save $200 in airfare by selecting a rather awful itinerary, but I’m not sure I would do that again. In spite of traveling during the post-holiday rush, by some stroke of luck I arrived in Portland on time (midnight local time, which felt like 3am! 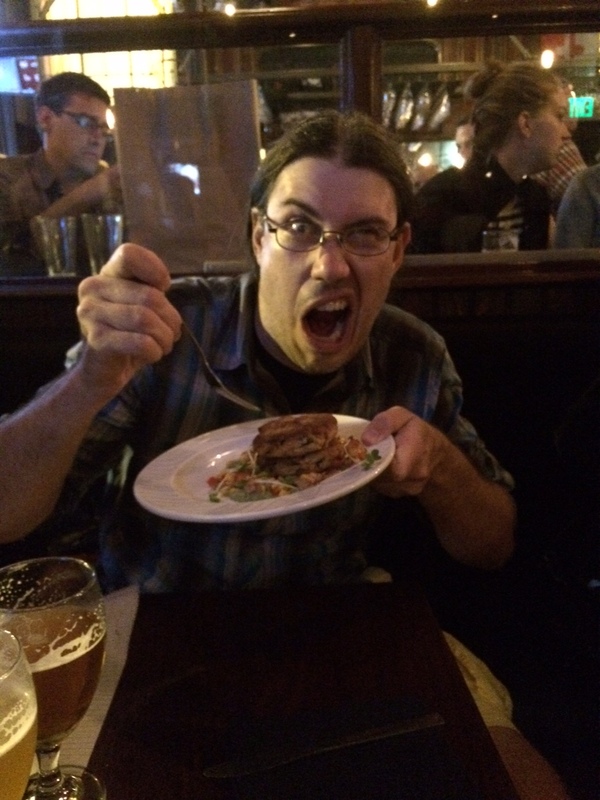 ), eager to sleep and then take on SICB! The 2016 annual meeting of the Society for Integrative and Comparative Biology (SICB) began with a plenary talk by Dr. Terrie Williams from UC Santa Cruz. Dr. Williams discussed a number of her research projects involving the energetics of big carnivores. This of course meant many awesome photos of her study organisms, which include polar bears, pumas, killer whales, and lions. For me, the most memorable part of her talk was about her research on narwhals. Yes that’s right, narwhals. Williams described narwhals as “endurance animals.” They cannot swim very quickly and attempt to escape predator attacks by submerging under arctic ice and hoping to “outlast” the predator’s need for air. The normal resting heart rate of a narwhal is about 60 beats per minute (bpm), similar to humans, but this slows to about 20 bpm when they dive. However, narwhals are very sensitive to disturbance, including shipping noise, and, when disturbed, their heart rate slows to as few as 3 to 4 bpm! It takes over an hour to return to the dive rate of 20 bpm. The consequences of this drastic physiological change are unclear, and Williams wonders how these animals will be able to cope as the Arctic is further disturbed by seismic surveys and exploration for oil and other resources. Much of Williams’s other research was just as interesting (polar bears on treadmills! ), and her talk was a fabulous opening the conference. In addition to really cool talks like this, SICB is a great meeting for grad students to attend for several reasons. They have strong financial support to allow cash-strapped students to attend. For instance, SICB offers the Charlotte Magnum program, which gives discounted housing in exchange for volunteering to help out at the conference for up to a half a day (though you should find a friend since you’ll be sharing a bed or sleeping on a floor!). The volunteering involves helping at the registration desk or running A/V for a particular session. This can be a great chance to meet a cool group of scientists who are presenting in a session of special interest, and mostly just involves watching talks you want to see anyways! 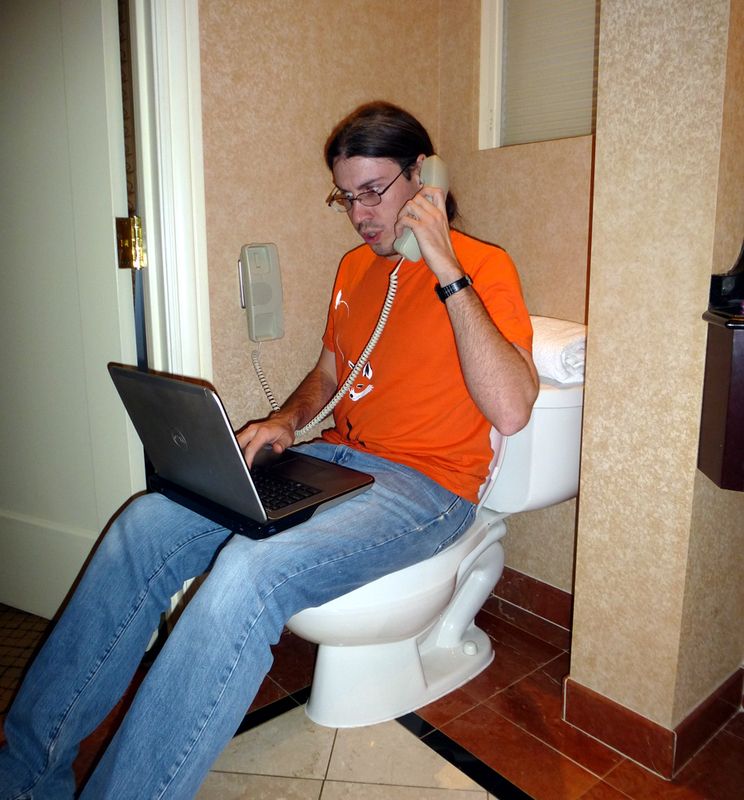 SICB student accommodations often include unheard of amenities, such as the incredibly rare toiletphone, so you can conduct business while….conducting your business. SICB also offers special support for women grad students and post-docs as well as competitive grants for graduate student travel and research. The divisional structure of SICB also offers lots of chances to meet big-name scientists at smaller events, like socials, and provides great opportunities for networking or figuring out possibilities for your next position, either in a grad program or as a post-doc. Lastly, SICB is one of the better-organized conferences out there (maybe due to all the brilliant grad students helping to run it!). 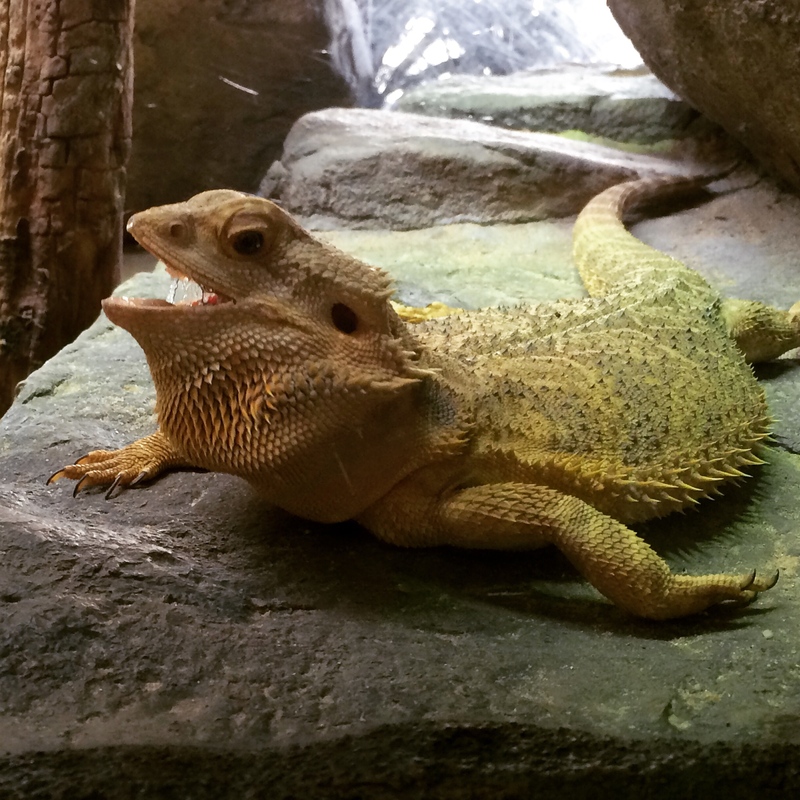 Testing and posting your presentation is very easy (our lab’s videos of lizard behaviors always work at SICB…unlike at some other meetings…). This year, for instance, with registration, SICB included weekly passes for unlimited rides on the Portland public transit system, including the convenient MAX light rail, which made getting around Portland really easy. Chris T and I were up for student awards in our respective divisions (the Division of Ecology and Evolution (DEE) and Division of Comparative Endocrinology (DCE)), and our talks were back-to-back on the first day of the conference. Our talks were well received, and we were in good company–the other talks in our sessions were great! Also quite memorable was the Division of Comparative Endocrinology’s Data Blitz, which took place during the DCE social. In this event, speakers have 2 minutes to describe research results, and they usually do so in unconventional ways. Poetry, photoshop, and Star Wars references abounded. One speaker also told a story of a research assistant meeting–and leaving field work for–a unique and sensual man. Suddenly my field stories don’t seem so exciting! DCE’s flyer for the Data Blitz. I’ll be sure to attend next time I’m at SICB! I also took the opportunity to explore the area. My first stop was to the unfathomably large Powell’s Bookstore, which boasts an inventory of over two million books. Two million!! I spent time in two of their eight rooms but easily could have spent hours perusing their stock. They also had a great quantity of board games and other novelty items. I should have brought a larger suitcase! Don’t be fooled, Powell’s takes up the entire block! Just down the street from Powell’s, I stopped in at Billy Galaxy, which has an impressive display of (overpriced) vintage toys and collectibles from the 70s, 80s, and 90s. I drooled over some Star Wars and Jurassic Park toys and continued onward with my bank accounts intact. Billy Galaxy’s small but impressive store, with plenty of collectibles from Star Wars, Smurfs, Transformers, Jurassic Park, Nintendo, Godzilla, and more! I also stopped at Voodoo Doughnut, a Portland staple. They had all kinds of novelty doughnuts, stuffed with colored cream and topped with cereals. I took on peanut butter oreo doughnut, which was delicious but horribly sweet. Definitely something to be shared. Next time I’ll bring a friend! The unique and protruding neon sign at Voodoo Doughnut and the squished peanut butter oreo doughnut that I conquered. All in all it was a successful trip, full of good science talks, satisfying food places, and even a few trolls. 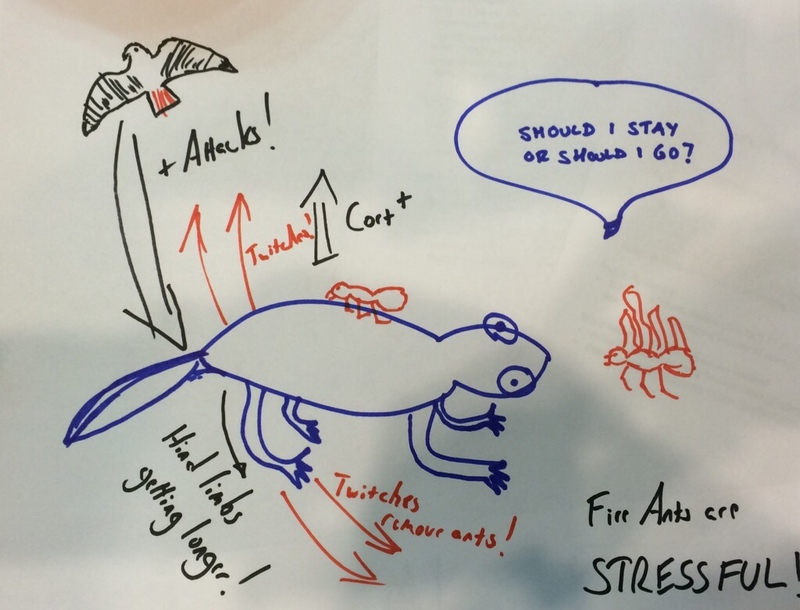 Thanks to Chris T for adding in why SICB is such a great conference! Categories: Articles and Presentations, Lab News | Tags: communication, conference, meeting, portland, presentation, Research, sicb, talks, troll | Permalink. 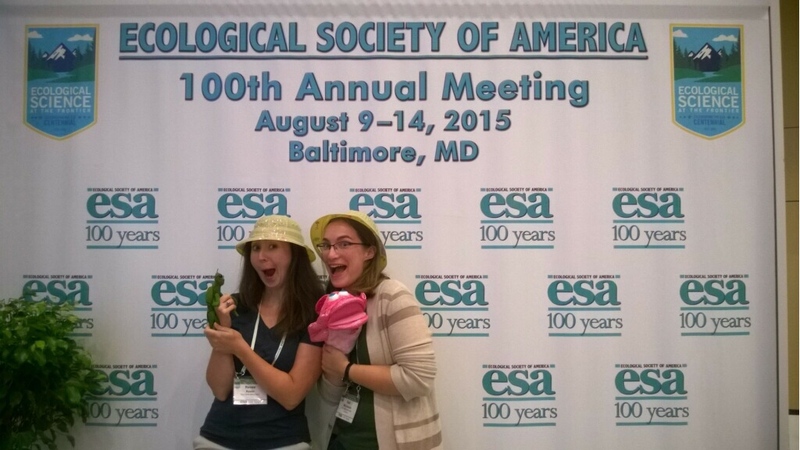 Earlier this month, the Chris’s and I traveled to Baltimore, MD for the centennial meeting of the Ecological Society of America. 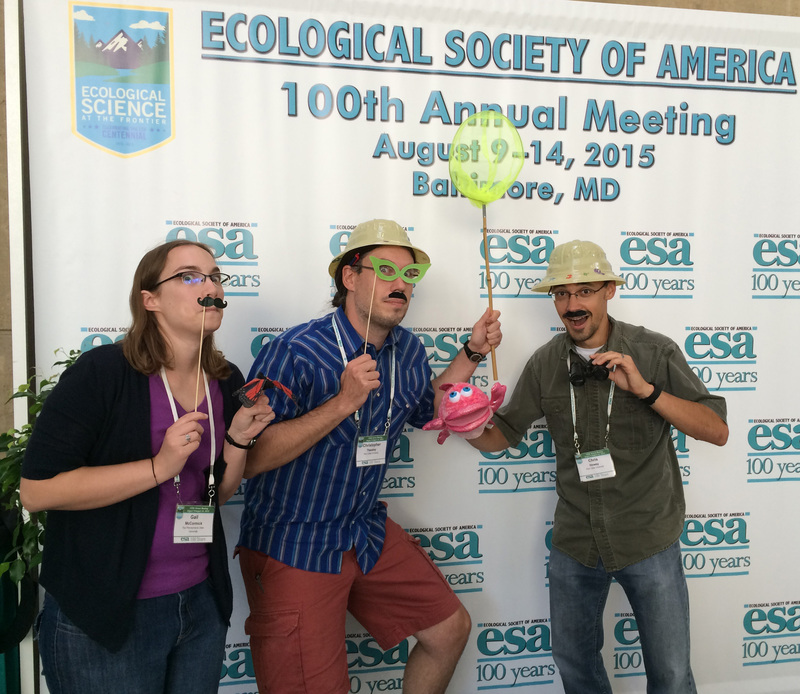 Because it was their 100th meeting, a great diversity of ecologists were in attendance. It was big! I received a student travel award to help support my attendance at the meeting. 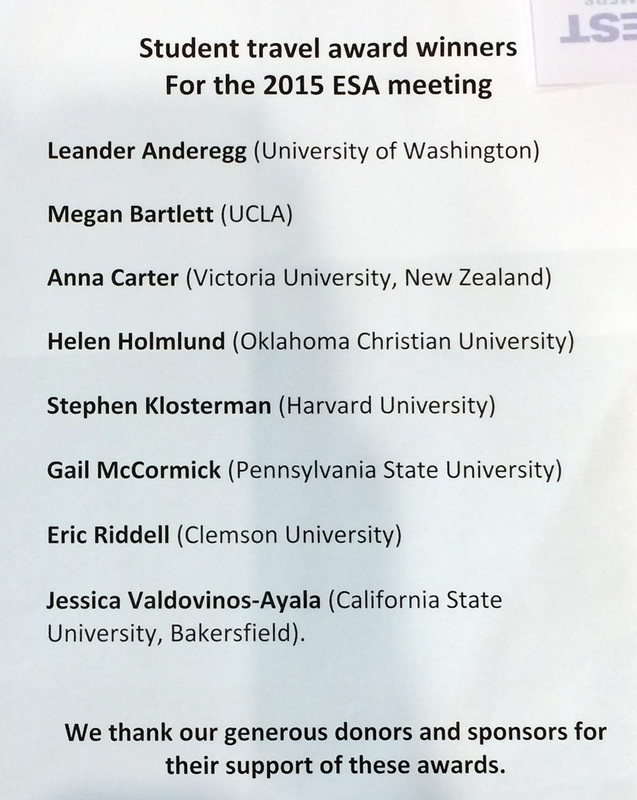 Thanks ESA Physiology Section! I am happy to report that all of our talks went well. It was also so great to see Langkilde Lab Alum Renee Rosier, who gave a talk on fence lizard nesting behavior. Penn State was very well represented at the meeting, and we frequently ran into our colleagues from the Shea, Miller, Post, and many other labs. We hope that their talks and posters lead to fruitful conversations! We also attended many interesting talks, and Howey moderated a session. One of my favorite talks was given by Paul Abram from the University of Montreal who was investigating why some stink bug eggs have a darker pigment. The answer, it turns out, is very complicated, and it was fascinating to see the results of a number of small studies trying to pinpoint the nature of this pigment (which isn’t melanin!). 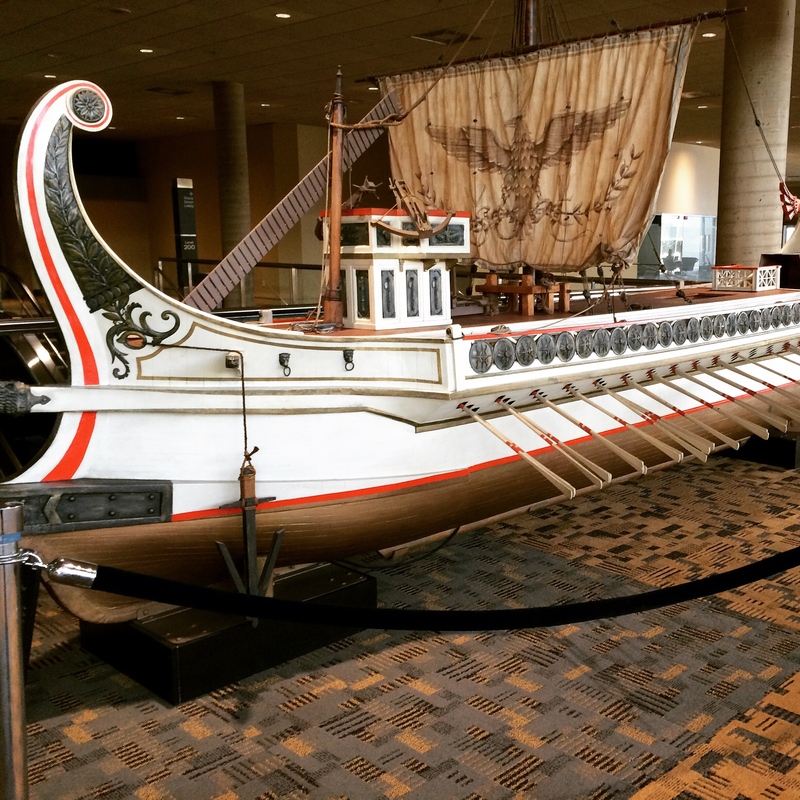 The Baltimore Convention Center houses many model ships. This large model was once used in the movie Ben Hur. Perhaps one of the most notable incidents occurred when the fire alarm went off during a session on Thursday. The Convention Center comfortably held a few thousand ecologists, but less so the surrounding streets! Luckily, this occurred near the end of a session, and the last few talks were squished into the remaining time. While we were there, we couldn’t resist the chance to explore Baltimore. Chris and Chris partook of a dinner of invasive species at Alewife. Thawley had the Snakehead fishcakes, and I’m told Howey’s invasive boar sliders were excellent!. After dinner, the Chris’s won trivia in a bar full of ecologists. Way to represent! Thawley diving into his Snakehead fishcakes at Alewife. 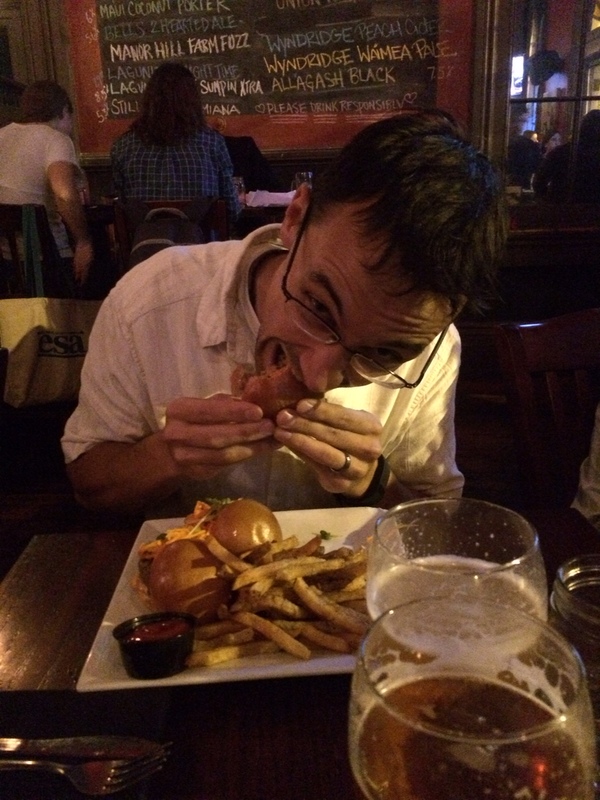 Howey enjoying his invasive boar sliders at Alewife. Renee and I had some fabulous gelato from the Little Italy neighborhood. 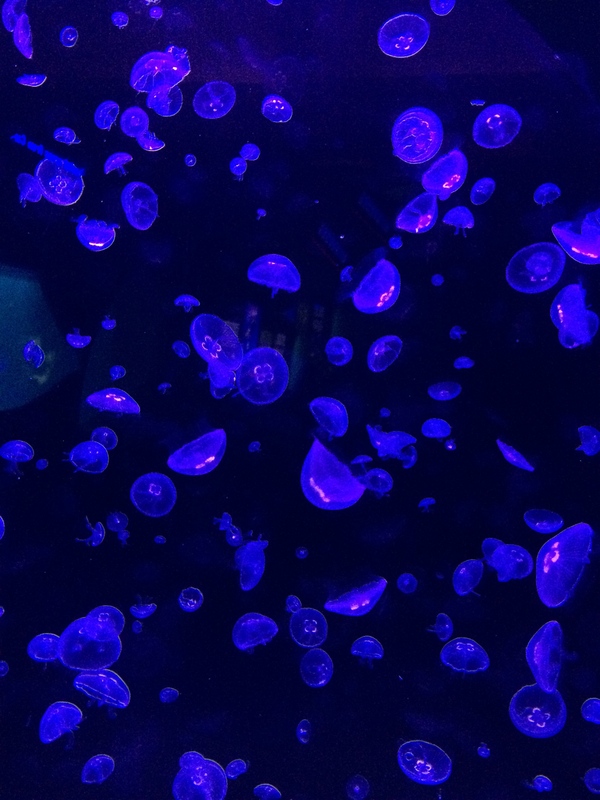 We also took a science break one morning to check out the National Aquarium. We particularly loved the Australia exhibit, and we couldn’t resist sitting in on one of the dolphin demonstrations! 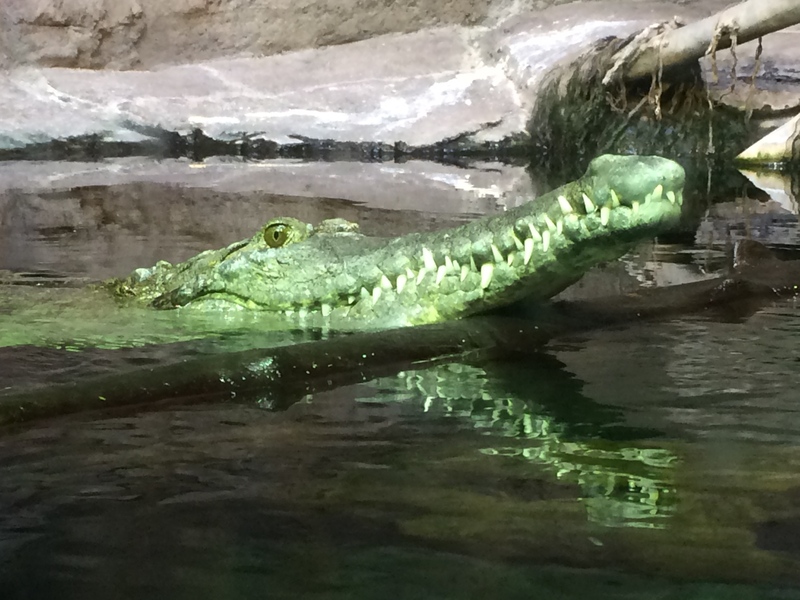 We had a great week in Baltimore, and we’re all looking forward to our next conference—for some of us, SICB! Hope to see you there! Categories: Articles and Presentations | Tags: annual meeting, baltimore, conference, ESA, ESA100, presentation, Research | Permalink.